Hello, and welcome to the beautiful resort of the Lucent Isle! We hope you have fun and enjoy your stay! Before you start playing, there are some rules that every resort member must follow. They are four very simple rules, and they're not too easy to break! If a fellow resort member does not want to play with you, please respond in a polite, respectful manner. DO NOT attempt to force them into playing with you! Please make a template (profile) of your person(s) before playing! This way we can make sure what our members like and what we can do for them! Respect your fellow resort members and resort staff with the utmost respect, no matter how much you dislike them. In the resort of Lucent Isle, everyone is equal and we'd like to see everyone as happy as possible! As long as you obey these rules, you shouldn't have any trouble with resort staff or members! Enjoy yourselves! 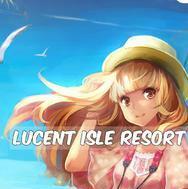 And again, welcome to Lucent Isle Resort! !